What is Dreaming? is Etan Boritzer’s 9th title in the best selling What is? book series on Life Concepts on character education and social issues. Children’s dreams are a mysterious and sometimes frightening subject. Dreams can be informative in dealing with everyday problems. What is Dreaming? will help to open discussion on children’s dreams and to unravel some of the subconscious concerns which children confront in their dreams, both scary and fun dreams. 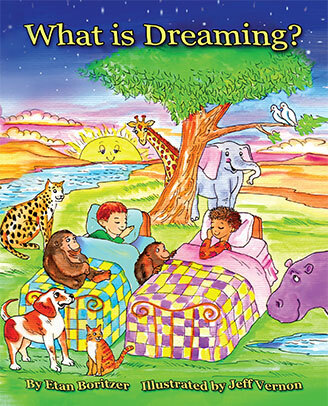 Parents, educators and child life professionals will find What is Dreaming? to be a valuable resource in dealing with children’s dreams. Author Boritzer’s clear and straightforward explanations plus the delightful and playful color illustrations of Jeff Vernon will make this book an important part of any library.